Astronomie - Was ist auf der Oberfläche eines Schwarzen Lochs? Mars-Chroniken - Siloe Patera – ein Supervulkan auf dem Mars? Raumfahrt - UrtheCast stellt weltweit erste Full-Color HD-Videos von der Erde aus dem All vor! 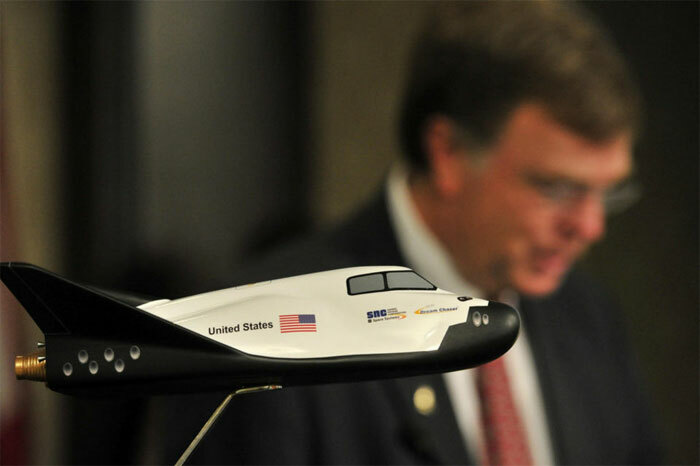 Local leaders this morning announced Huntsville will study feasibility of landing the Sierra Nevada Corporation's Dream Chaser spacecraft at Huntsville International Airport. Depending on the results of the study, Huntsville could become the first commercial airport landing a space craft, Mayor Tommy Battle said at the announcement Monday morning. The study will take about six months, and landings could begin as early as 2018 when Dream Chaser is expected to begin space flight. The spacecraft will launch to space on an Atlas rocket built by United Launch Alliance of Decatur. "The Dream Chaser spacecraft is proposed by SNC in the current NASA competition to supply cargo to the International Space Station," a media advisory from the Chamber said last week. "SNC also plans to operate the vehicle on other missions, tailored to a variety of U.S. and International Customers." "Alabama has been a leader in the space industry since the beginning and it is natural that Alabama would continue to play a vital role in the continuation of space exploration," Gov. Robert Bentley said in a statement. "Having Dream Chaser land in Huntsville would further highlight Alabama as the premiere destination for innovative, high-tech careers and keep our state on the cutting edge of history." Partnering with Sierra Nevada on the study is Teledyne Brown Engineering of Huntsville. Teledyne Brown has already worked with Sierra Nevada to study potential missions for the Dream Chaser, a spacecraft about 35 feet long and 25 feet wide that resembles a small space shuttle with upturned wingtips. Those missions could include ferrying cargo and science experiments to and from the space station; deploying, servicing and returning satellites for ground servicing; removing orbiting space debris; and staying in orbit for long periods as a platform for science experiments. Dream Chaser will be able to fly with a crew and without one. The first challenge is studying the potential damage to the asphalt runways at Huntsville International Airport. Dream Chaser lands on two rear wheels and deploys a front skid plate. The runway also includes embedded lights that could be affected. If the runway impact is manageable, the project's partners will begin negotiations with the Federal Aviation Administration. Teledyne and Sierra Nevada executives said other issues include the impact on aviation, the environment and birds and wildlife in the airport area. Huntsville International is a realistic option for landing the Dream Chaser because of widely separated runways long enough to handle the largest commercial jets. It is busy at certain times of the day, but also has scheduling gaps that could make Dream Chaser landings easy to handle. The Dream Chaser will go from orbit to ground in about an hour, Sierra Nevada officials said. Once the decision is made to land and Dream Chaser's de-orbit engines are fired, the spacecraft is coming down. It cannot be waived off for another approach to the airport. Sierra Nevada lost out to Boeing and SpaceX in NASA's competition to fly astronauts to and from the space station, but it is still in the running to deliver cargo. The announcement coincides with the annual Paris Air Show, the biggest show dedicated to the aerospace industry worldwide. City of Huntsville Director of Communications Kelly Schrimsher said Thursday the Sierra Nevada announcement was made simultaneously in Paris.